Steven Land has completely exploded onto the mens fashion clothing seen in just a few short year. First Steven Land started his brand with just a few flashy pattern silk ties and then received accolades with his Big Knot Tie Collection. After that, it became clear that he should compliment his richly designed silk ties with fine cotton dress shirts and those became immediately successful. In fact, Steven Land shirts became so successful that in no time at all other dress shirt brands started copying his bold and loud pattern designs into their dress shirts. Now, you'll find fine leather dress shoes with Italian style and head turning mens suits as well and the list goes on and on. Steven Land has quickly become a huge brand name in the mens fashion world no different than say a Calvin Klein became back in the 1980s. 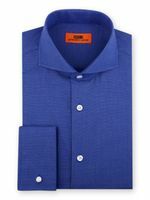 When dressing with style and bold color combinations speaks to you, Steven Land is the only brand to consider. See what you can find for a Prom Suit quick. Steven Land makes fine dress shoes that reflect the smooth clean style that compliments the style ideology of the Steven Land collection. Enjoying the affordable luxury of hand made all leather Steven Land Shoes on your feet is an easy and stylish venture. 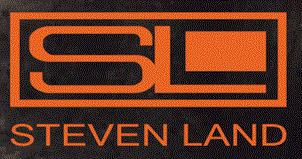 Steven Land suits combine trend setting designer style with fine wool fabrics designed to get you noticed. They put the same fashion attention into their fine wool suits as they do with their stylish shirts and ties. Steven Land now makes slacks with style and their famous attention to suit quality construction is what you're going to get with their great looking dress pants. These dress pants are not only made of fine quality fabric but have the quality construction that you demand in your slacks and style that you would demand from design house of Steven Land. Steven Land sweaters are a commitment to the philosophy and design elements that has made Steven Land the go to design brand in the last few years. 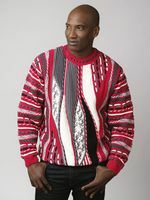 These sweaters are made of rich 100% cotton yarns and are proudly Made in the USA just the way Steven Land likes it. For the man who prefers his silk ties with bold avant garde styling that simply won't be ignored, there are Steven Land Big Knot Ties. Steven Land silk ties have colors and patterns that will turn heads where ever you go. You'll see them on Professional Athletes and Celebrities when they aren't on the field or behind a camera.